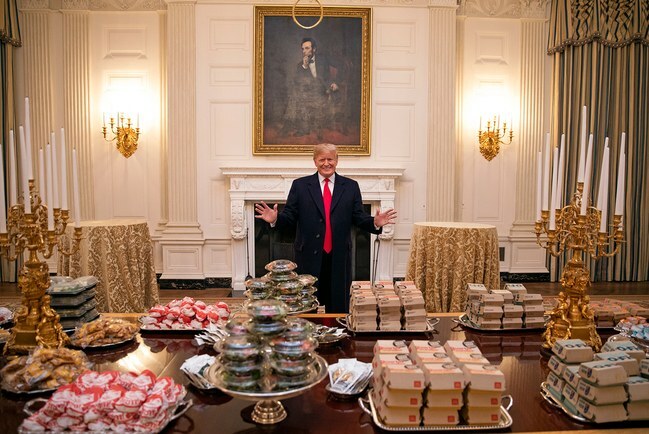 By now we are all familiar with how during the recent government shutdown, the President famously served the NCAA football Champion Clemson Tigers fast food for their visit to the White House. Out of curiosity, do official presidential photographers know right away if a picture is going to become an iconic image of a presidency? What will the President serve when the SuperBowl Champions make their White House visit? So you just pay for your drink and leave. For people who love it quick and cheap (I’m just talking about pizza here), Little Ceasar’s Hot N Ready Pizzas check all the necessary boxes! Originally the complex algorithm I used to formulate this list gave Del Taco the nod over Taco Bell. However, once I entered the Doritos Los Tacos shell into the equation, it wasn’t even close. It is impossible to have any fast food list that does not include McDonald’s somewhere. I gotta be honest here, Arby-Q sandwich aside, I am just not a big Arby’s fan. Their chicken isn’t bad, but anytime I have tried their ‘famous roast beef‘, it has been been highly reflective and nearly translucent in color. Kinda weird for anything coming off a cow, right? Side note: Something I didn’t know before, Arby’s (pronounced “R.B.”) gets it’s name from the initials from their main product: Roast Beef. R. B. I felt dumb for not previously knowing this. I’ll tell you what I am a huge fan of: breakfast for dinner! I will chow down on eggs and French toast anytime of the day or night. Just like my homeboy Alex Bowen of South Carolina who prepared his own Waffle House meal (live on social media) when the staff fell asleep! You gotta give Pizza Hut credit for effort. They surely don’t create the best pizza on the globe, but they are always willing to try new creative and inventive marketing gimmicks, such as substituting Cheesy Bites for pizza crust or inserting hot dogs into the crust. Full disclosure: I was actually a big fan of this one. While this is might be bending the rule regarding “fast food” a little bit, I surely ate and enjoyed my share of Jose Ole products when I was in college. WHEN I WAS IN COLLEGE. “In college” being the key words in that sentence. Sliders have gained in popularity over the past decade and there is no more famous chain of sliders than White Castle. In that way, they are basically the ‘small plates’ of the fast food world, except very greasy and they taste better at 2 AM on the way home from the bar when you are still half drunk. You know you want to see secret service agents walking around the White House with White Castle Crave Cases hand-cuffed to their wrists as if they were carrying nuclear launch code briefcases. I know I do. While bending the fast food slightly once again, Totino’s Pizza Rolls are my favorite go-to football watching snack! It is a tiny pizza that is fried. I mean that is sheer brilliance! Whoever thought this up and engineered it should be running our space program. We could have colonized half the galaxy by now. All joking aside, I like Boston Market food. And if Boston Market does end up catering the event, it wouldn’t be the first event I snuck into just to jack some tasty Boston Market Mac ‘N’ Cheese! Hitting an In-N-Out Burger is mandatory on any west coast trip. Aside from being so geographically limited and serving one of the best fast food burgers on the market (although I rank Wendy’s pretty high on the list as well), In-N-Out also has palm trees on their cups and french fry boats. What screams “California” more than that? Well, that is my list. What did you think? Did I miss any fast food chains you think belong on White House silverware? And if you enjoy my humor, please like this article and share it with your friends. Thank you. Jack n the Box’s tacos and egg rolls they are the best! You can even buy the egg rolls in packs of 3. Tacos are only 2/$1. Always heard about taco bells but never had any and those pizza rolls just look too good and I am here on a diet. Ha! I just learned a new fact about the origin of Arby’s name. I cannot believe the Pizza Hut hot dog bun crust. I thought it was a joke, but then again, with the popularity of margarita burgers, I guess anything goes! So funny! I’ve also wondered if White House photographers know they’re shooting an iconic image. This one will definitely be part of his legacy. Haha! Fun post! I’d love to be served In n Out! If I went to the White House I would definitely want the pizza rolls since I never buy them at home. LOL. But that Pizza Hut pizza with the hot dogs in it kind of looks like one of the photoshopped photos from the internet telling you to be careful of something or you will get pods in your skin. 🙂 Also, it would be cost prohibitive to fly In and Out in from California, and more than likely the fries would be cold by the time they got there. Great list!